Barrisol is the world leading manufacturer of suspended ceilings. This material lights up and gives the impression that it is at one with the building where it is installed also offers an element of acoustic attenuation. This product is mainly used for classical interiors, the smooth and horizontal canvas producing an alternative light that is easy to install other suspended ceiling systems. Studying in depth the stretching properties of the material, we found that it had the ability to take the form of minimal surfaces, as they are called in the field of mathematics. This means that even if the canvas is flat, when it is cut and assembled with high accuracy, it allows for creation of volumetric three-dimensional shapes. The aim of this project is to illustrate the inherent value of this material using innovative manufacturing technologies, such as digital cutting or digitally controlled three-dimensional folding machines, for a high level of accuracy on an architectural scale. 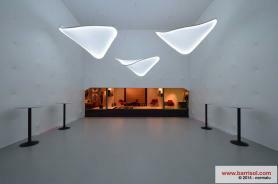 Thanks to the stretching properties of the material studied in the first version of the design, we get superb, illuminated large objects that illuminate and enhance the acoustic qualities of the spaces they inhabit. The Barrisol stretched canvas and 3 dimensional tubular frame form a coherent entity. A single stand was created to present this lamp at the Biennale Interieur in Kortrijk, Belgium, which was also built by Barrisol for the purpose of illustrating the other possible applications of this materials. The project at large examines various properties of the materials used for the Barrisol stretched canvas such as its reflection, acoustic attenuation and exceptional translucency. Barrisol is proud to announce their collaboration with Ross Lovegrove, an organic forms design specialist. These special organic forms were created with Barrisol products, bringing together material with its unique properties, mastery and over 45 years of Barrisol's exceptional experience. Read the "BARRSIOL LOVEGROVE" brochure.